The Central Otago Visitor Centres can arrange all your Central Otago accommodation requirements. Check out images of the new Clutha Gold Trail. Accommodation available in the Roxburgh area. Check out images of 'Roxburgh on Pinterest. Scorched morning rays herald a patchwork of fruit orchards alongside farms that creep toward tussock-clad hills. Magnificent mountain ranges hold vigil over the mighty river and its offshoots, safeguarding secrets of times long since past. Roxburgh town lies alongside the Clutha River in the beautiful Teviot Valley. Its lake was created by the Roxburgh Dam, commissioned in 1956. Pre-European Maori hunted the now extinct, giant flightless Moa here. Settlers began farming in the late 1850s and gold miners quickly followed. They left behind historic relics and streets named after Scottish borders. Learn the story of the miners' Lonely Graves at Millers Flat, where there is also an old bakehouse, suspension bridge, and the stone ruins of a Teviot woolshed. In Roxburgh, some beautiful mud-brick and stone buildings are still in use, and the gorge has many preserved Chinese rock shelters. Taste exquisite summer fruits of cherries, apricots, plums, nectarines, peaches, pears, berries and apples at roadside orchard stalls, also laden with preserves, juices, and fresh vegetables. Fish for salmon on the Clutha, and trout in the lakes. Indulge in water sports on Lake Roxburgh. Walk the Town River Walkways, Old Bullock Trail and others, or four wheel drive, mountain bike, or trek into the hills. 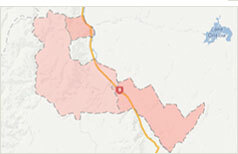 The Teviot Valley is a ribbon district that runs either side of State Highway 8. Its main town and retail hub is located at Roxburgh. The smaller communities of the Teviot Valley include Lake Roxburgh Village, Ettrick and Millers Flat. Experience the great outdoors in one of the most stunning playgrounds in Central Otago. From walking and cycling to swimming and fishing, the Teviot Valley boasts beautiful tracks, reserves, lakes and rivers. The Teviot Valley has a variety of accommodation for travellers to relax from lodges to B&B's, motels and backpackers. Maori and European settlers have written a rich history in our Valley. Evidence of these stories can be seen in the landscape, buildings and people that you will find here. A spectacular one-day ride through truly iconic country, between Alexandra and Roxburgh Dam along the Clutha Mata-au River is a trail worth exploring. This trail is a unique heritage experience along the mighty Clutha Mata-au River. Starting from Roxburgh, this trail travels through the Beaumont Gorge branching off into the rich green valley's towards the historic gold mining town of Lawrence. Roxburgh and the Teviot Valley is a vibrant community, where positive attitudes prevail and people work together to achieve common goals and participate in community life. There are a number of activities and events to explore while visiting Roxburgh and the Teviot Valley. Roxburgh and the Teviot Valley has a number of takeaways, cafes and restaurants for visitors, locals and those just passing through.